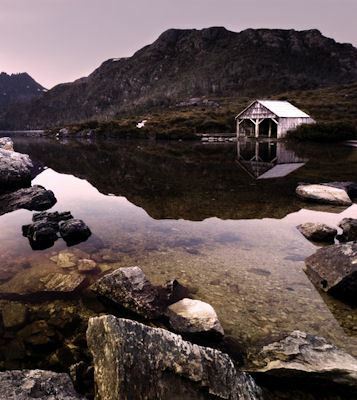 Here's why you should discover Tasmania in a campervan or motorhome from AutoRent. On some holidays you can lie on the beach and soak up the sun. On others, you can explore remote regions off-the-beaten-track. On a campervan holiday you can do both - and a lot more in between! A campervan holiday has all the fun of camping without tents to erect, trenches to dig and firewood to find. There’s no coach driver telling you it’s time to go. There’s no itinerary telling you where you’ll be staying each night. There’s no 10 o’clock check out. Holidays should be about lazy sleep-ins and late breakfasts, the simple pleasure of touring and the greater pleasure of finding a place to call your own for a day or two. And, with a campervan holiday, the self-contained kitchen keeps meals costs very low indeed. Where on earth would a campervan holiday be better than in Tasmania? Compact, scenic, historic, uncrowded and unspoilt. Naturally, you want to be sure that your holiday will be enjoyable. You’ll be looking for the right vehicle at the best price from a reputable operator. Will the company I hire from have plenty of experience and local knowledge, be big enough to have back-up facilities and small enough to care about MY holiday? AutoRent has been involved in campervans and motorhomes for decades. We know the big and the little things that are important to your holiday. We believe and act as if our reputation depends on what you think. (It does). All vehicles are well-maintained by our own staff but if anything does go wrong, Roadside Assistance with the Royal Automobile Club is just a phone call away, 24 hours a day, every day of the year. Is this the type of vehicle I'd choose to drive? Campervans are very similar to a car to drive, being easier to drive and manoeuvre than a motorhome. A motorhome has its living area constructed on a light commercial vehicle, with either a single or twin cab (which determines the number of people who can be carried). Motorhomes have more living space with the advantage of a permanently made up double bed and a separate dinette. Our experience over many years is that very few drivers haven't easily adjusted to driving the larger vehicles. Will we have enough room? If your party consists of 2 people, any of our fleet would be suitable, depending on the amount of room you'd like. Our campervans accommodate 2 adults, with the high roof providing extra space for 2 small children. Our 2-Berth motorhomes provide the option of shower and toilet, one with and one without, and both are ideal for 2 adults (double or twin share). The 2-4 Berth Motorhome is ideal for 3 or 4 people (depending on their ages) and the Premium Motorhome has room for 3 adults or 2 adults and 1 or 2 small children however is ideal for 2 people to travel in superb comfort. How can I best judge which holiday offers VALUE for my money? Ease of purchase - you need make only one booking to cover your accommodation and transport. Savings on meals - your self-contained kitchen can make a big difference in meal costs. Consistent standard throughout - there won't be any surprises at the end of each day. It's comforting to know that the same high standards you find on day one should be there on every other day too. Flexibility - arrange your itinerary as you go. Stay put or move on without any cancellation fees to worry about. Looking for the best places to stay overnight right around Tasmania? To help you get started on planning your holiday Click here . Be it positive or negative, we invite and welcome comment from our renters. At the end of each rental, clients are given a link to complete our on-line survey to provide us with a candid assessment of our performance and our service.